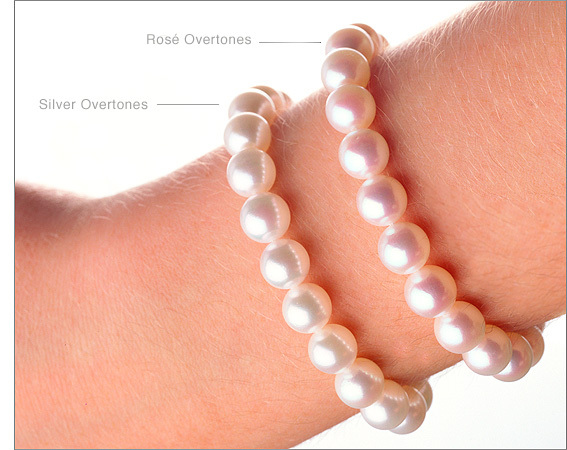 People often ask us how to choose between rosé overtone pearls and silver overtone pearls. A consumer shopping for pearls should know that Tiffany & Co. sells silver overtones whereas Mikimoto is known for selling rosé overtones. According to the GIA (Gemological Institute of America) rosé overtones, as well as silver overtones improve the value of white pearls. Women who have fair skin prefer pearls with rosé overtones as they feel this color compliments their skin tone best. Women who have olive skin, darker skin or women who enjoy a year-a-round tan usually purchase silver overtones. If you've ever seen royalty wearing pearls, their pearls are usually white. This is our recommendation. Of course, the final choice lies with you or the recipient of the pearl necklace. Remember too, pearls absorb the surrounding colors due to their reflectiveness. Ultimately, once draped around the necklace, it is honestly difficult to notice the difference between rosé or silver overtones as it is very subtle. One should always purchase the color they are passionate about.